AMA Queensland walks beside members throughout their career, including medical students, doctors in training, senior medical officers, general practitioners, specialists and retired doctors. We support you and your colleagues in advocating for the strongest health system in Queensland through to provision of individual advice, support and representation on issues that affect you in the workplace. A one-off 50% exam concession is available for junior doctors that sit an exam. Please contact AMA Queensland staff to access this reduction. AMA Queensland’s Member Get a Member program offers an outstanding financial incentive for existing members to introduce new doctors to join AMA Queensland. 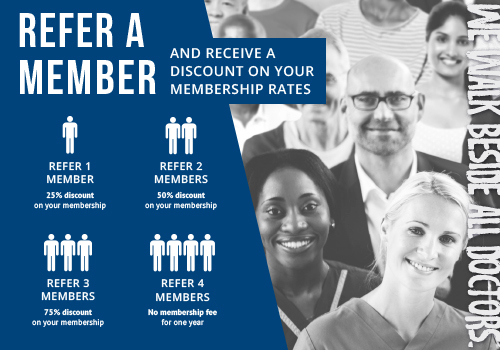 If you refer a colleague who successfully joins AMA Queensland, you will receive 25% off your next year's membership. This 25% discount applies for each doctor you refer (maximum four referrals per year).